AMENDED AND RESTATED BYLAWS OF THE VIRGINIA SHERIFFS ASSOCIATION, INC. Section 1. 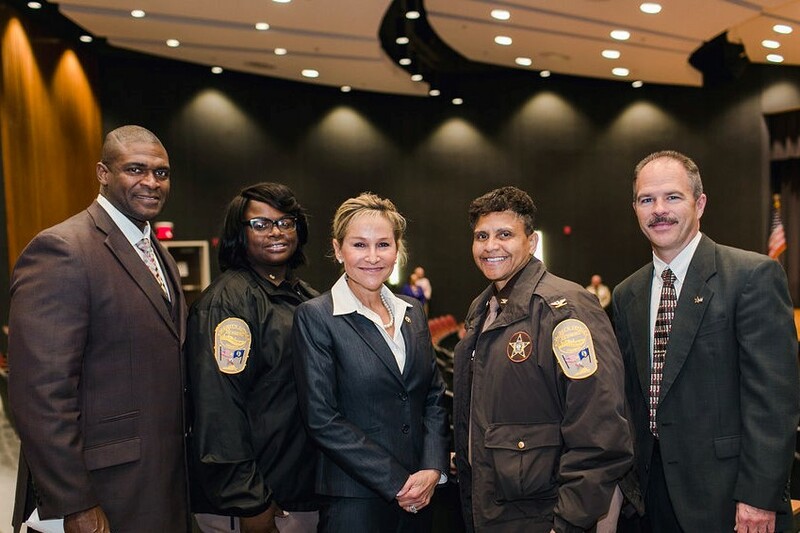 The affairs and activities of Virginia Sheriffs Association, Inc. (the “Association”) shall be carried out at all times for the purposes and in accordance with the terms set forth in its Articles of Incorporation and these Bylaws, and in conformity with all applicable provisions of the Internal Revenue Code of 1986, as amended (the “Code”) affecting nonprofit organizations described in Section 501(c)(6) of the Code. Section 1. Membership Classes. The Association has two (2) classes of membership, Active members and Non-active members. Section 2. Active members. Active members shall consist of sheriffs and the staff of each sheriff’s office, provided they are members in the Association. As used in these Bylaws, staff shall include deputy sheriffs and all civilian members of each sheriff’s office. (A) Voting Powers of Active Members. Active members of the Association shall have the right to vote in connection with all actions taken by the Association, including but not limited to, the election of the Officers and the Board of Directors. Each sheriff’s office shall be entitled to two (2) votes. One vote from each office shall be cast by the member sheriff. In addition, one vote from each office shall be cast on behalf of the staff by a representative chosen by the staff from each sheriff’s office. (A) Lifetime members. Any Active member may nominate a person for lifetime membership by sending a written nomination to the Chairman of the Nominating Committee at least sixty (60) days prior to the annual meeting of the Association. This committee shall submit a list of nominees at the annual meeting to be voted on by the Active membership pursuant to Article II, Section 2 of these Bylaws. Lifetime members may attend all Association meetings pursuant to the policies and procedures adopted by the Board of Directors, but shall have no right to vote. Lifetime member nominations shall consist only of former Active members who were sheriffs or sheriff office staff. (A) Lifetime members may be removed by the Board of Directors. Section 1. Annual meetings. The Association shall hold an annual meeting of the members. Members of the Association shall be notified in writing at least fifteen (15) days prior to the annual meeting. The annual meeting of the Association shall be held each year at such hour, on such day, and at such place, in or out of the Commonwealth of Virginia, as fixed by the Board of Directors, for the purpose of electing Directors and for the transaction of such other business as may come before the meeting. Section 2. Special meetings. Special meetings of the members of the Association may be called by the President, the Board of Directors, or not less than one‑third (1/3) of the Active members. No business, other than that specified in the notice for the special meeting, shall be transacted. Each member of the Association shall be notified in writing not less than ten (10) nor more than sixty (60) days prior to the date of the meeting. Notwithstanding the foregoing, however, notice of a meeting of the members to act on an amendment to the Articles of Incorporation, plan of merger, a proposed sale of substantially all of the assets, or the dissolution of the Association shall be delivered not less than twenty‑five (25) nor more than sixty (60) days prior to the date of the meeting. Section 3. Quorum. A quorum of the Association membership shall be twenty‑five (25) Active members. Section 4. Voting At all meetings of the membership, Active members may only vote in person. Active members shall not vote by proxy. Section 1. Dues. The dues for membership shall be established by the Board of Directors. Section 1. Authority. The Board of Directors shall be responsible for the management of the Association and shall have the authority to act on behalf of the Association, as they deem proper, but not in conflict with these Bylaws, the Articles of Incorporation of the Association or the laws of the Commonwealth of Virginia. Section 2. Composition. The Board of Directors shall consist of Active members who shall be the officers of the Association, the Regional Directors of the Association, the Chairman of the Legislative Committee, and the Immediate Past President, and three other past presidents of the Association, who are Active members. Section 3. Number of Directors. The number of directors constituting the Board of Directors shall be no more than twenty (20). Section 4. Election. The Board of Directors shall be elected by the Active members at the annual meeting pursuant to Article II, Section 2 of these Bylaws. Vacancies occurring on the Board of Directors between annual meetings shall be filled by the Board of Directors. Section 5. Term of office. Directors shall serve for a term of one year or until their successors are duly elected. Any Director may be removed from office at a meeting called expressly for that purpose by the vote of the Board of Directors. Any vacancy occurring in the Board of Directors may be filled by the affirmative vote of the majority of the remaining Board of Directors though less than a quorum of the Board, and the term of office of any Director so elected shall expire at the next annual meeting at which Directors are elected. Section 6. Directors’ meetings. Regular meetings of the Board of Directors shall be held following the annual meeting of the members and at such other times as the Board of Directors may determine. Special meetings of the Board of Directors may be called by the President or Executive Director, at the President’s direction, at any time, and shall be called by the President or the Secretary upon written request of four (4) Directors. Directors may participate in a regular or special meeting by, or conduct the meeting through use of, any means of communication by which all Directors participating may simultaneously hear each other during the meeting. A Director participating in a meeting by this means is deemed to be present in person at the meeting. Directors shall not vote by proxy. Section 7. Notice of meetings. Notice of meetings shall be given to each Director at least seven (7) days prior to the meeting. Section 8. Voting. Action by the Board of Directors shall be by a majority vote of the Directors present, providing a quorum has been met. Section 9. Quorum. A quorum shall consist of nine (9) members of the Board of Directors. Section 10. Regional Directors. Regional Directors shall have the responsibility to keep the Active members in their particular Region informed on all matters of Association business. Section 1. Number. The officers of the Association shall be the President, the First Vice‑President, the Second Vice‑President, the Secretary and the Treasurer. No officer shall hold more than one office in the Association. Section 2. Election. All officers of the Association shall be elected annually by the Active members and shall be ratified by the Board of Directors at the annual meeting and shall hold office for a term of one year or until their successors are duly elected. The Board of Directors may appoint such other officers, agents, and employees as it shall deem necessary who shall have such authority, and shall perform such duties as from time to time shall be prescribed by the Board. (A) President. The President shall preside at all meetings of the Board of Directors and the members. The President shall present at each annual meeting of the members and Directors a report of the condition of the business of the Association. The President shall cause to be called annual and special meetings of the members and regular and special meetings of Directors in accordance with these Bylaws. The President shall enforce these Bylaws and perform all the duties incidental to the position and office of President, and which are required by law. The President may approve, sign, make, and endorse in the name of the Association, all checks, drafts and warrants, and orders for the payment of money, and pay out and dispose of the same and receipt thereof, under the direction of the Board of Directors in the absence of the Treasurer. (B) First Vice‑President. During the absence or inability of the President to render and perform the duties or exercise the powers of the President, as set forth in these Bylaws, or in the laws under which this Association is organized, the same shall be performed and exercised by the First Vice‑President; and when so acting shall have all the powers and be subject to all the responsibilities hereby given to or imposed upon such President. (C) Second Vice‑President. During the absence or inability of the First Vice‑President to render and perform the duties or exercise the powers of the First Vice-President, as set forth in these Bylaws, or in the laws under which this Association is organized, the same shall be subject to all the responsibilities hereby given to or imposed upon such First Vice‑President. (D) Secretary. The Secretary shall keep the minutes of the meetings of the Board of Directors and of the members in appropriate books of record. The Secretary shall be custodian of the records of the Association. The Secretary shall present to the Board of Directors at their meetings all communications addressed to the Secretary officially by the President or any officer, Director, or member of the Association. The Secretary shall attend to all correspondence and perform all the duties incident to the office of Secretary. The Secretary shall be the chairperson of the Membership Committee during the term as Secretary. (E) Treasurer. The Treasurer shall have the care and custody of, and be responsible for, all the funds and securities of the Association, and deposit all such funds in the name of the Association in such bank or banks, trust company or trust companies or safe deposit vaults as the Board of Directors may designate. The Treasurer shall sign, make and endorse in the name of the Association, all checks, drafts, warrants, and orders for the payment of money, and pay out and dispose of same and receipt therefore, under the direction of the Board of Directors and under the policies and procedures adopted by the Board of Directors. The Treasurer shall exhibit at all reasonable times the books and accounts to any Director or member of the Association upon application at the office of the Association during business hours. The Treasurer shall render a statement of the condition of the finances of the Association at each regular meeting of the Board of Directors, and at such other times as shall be required, and a full financial report at the annual meeting of the membership. The Treasurer shall keep at the office of the Association correct books of account of all its business and transactions and such other books of account as the Board of Directors may require. The Treasurer may assign the above duties to the Executive Director of the Association under the direction of the Board of Directors and under the policies and procedures adopted by the Board of Directors. The Treasurer shall assist the Executive Director in filing all financial records of the Association, including an annual budget, monthly revenue and expense report, and a quarterly financial report listing each expenditure and purpose. The Treasurer shall perform all duties appertaining to the officer of Treasurer. The Treasurer shall give to the Association such security for the faithful discharge of the duties as the Board of Directors may direct. Section 4. Compensation of officers. The officers shall not receive any salary or compensation for their services, but may be reimbursed for actual expenses approved by the Board of Directors. Section 5. Executive Director. The Board of Directors shall appoint an Executive Director who shall perform such duties as the Board of Directors may prescribe. The Executive Director shall sign and make all contracts and agreements in the name of the Association. The Executive Director shall see that the books, reports, statements and certificates required by law are properly kept, made, and filed according to law. The Executive Director may be compensated for services as the Board of Directors may prescribe. Section 1. Indemnification. The Association shall indemnify, to the fullest extent permitted by the Virginia Non-stock Corporation Act, as such Act exists now or may hereafter be amended, its Directors, officers, employees and agents who are made a party to any proceeding by reason of their office for acts or omissions performed in their official capacity. Section 1. Limitation of Liability. The liability of any Director or officer in any proceeding brought by members (or a member) of the Association in the right of the Association or on behalf of the members (or a member) of the Association, unless otherwise provided by the laws of the Commonwealth of Virginia, shall be limited to One Hundred Dollars ($100.00) for any damages assessed against a Director or officer arising out of any single transaction, occurrence, or course of conduct pursuant to Section 13.1‑870.1 of the Code of Virginia, as may be amended from time to time. If an individual is both a Director and an officer, the limitation on liability stated above shall be the total aggregate amount of liability to which such person may be subject. However, pursuant to Section 13.1‑870 of the Code of Virginia, the liability of a Director or officer shall not be limited as provided in this Article VII of these Bylaws if the Director or officer engaged in willful misconduct or a knowing violation of the criminal law. Section 1. Seal. The Association may have a seal. The form of such seal shall be designated by the Board of Directors. Section 1. How made. All bills payable, notes, checks, drafts, warrants, or other negotiable instruments of the Association shall be made in the name of the Association, and shall be approved or signed by at least two of the following persons, pursuant to the approved budget: the Treasurer, the Executive Director, Deputy Director or the President pursuant to the policies and procedures adopted by the Board of Directors. The signature or approval of any such person may be a facsimile or electronic. No officer or agent of the Association, either singly or jointly with others, shall have the power to make any bills payable, note, check, draft or warrant, or other negotiable instrument, or endorse the same in the name of the Association, or contract or cause to be contracted any debt or liability in the name or on behalf of the Association, except as herein expressly provided by these Bylaws and the policies and procedures adopted by the Board of Directors. Section 2. Political Action Committee. The Board of Directors may authorize the Executive Director to be the sole administrator of the Political Action Committee of the Association and all of its funds. (A) Legislative Committee. The Legislative Committee shall be responsible for considering all matters relating to legislation affecting the office of sheriff in Virginia. The Board of Directors shall automatically serve on the Legislative Committee. In addition, the President shall appoint the Chairman and eight (8) other members. (B) Audit Committee. The Audit Committee shall be responsible to ensure that the financial transactions of the Association are properly audited. (C) Bylaws Committee. The Bylaws Committee shall be responsible for considering amendments proposed to the Bylaws and to present recommendations to the Board of Directors. (D) Membership Committee. The Membership Committee shall be responsible for encouraging and securing membership in the Association. During the term in office, the Secretary shall be chairman of the Membership Committee. (E) Nominating Committee. The Board of Directors shall appoint a Nominating Committee consisting of five (5) Active members, of which no less than three (3) shall be past Presidents of the Association, if possible. The Nominating Committee shall consider and nominate candidates for officers, Regional Directors of the Association, and three Past Presidents to serve on the Incoming Board of Directors. Members of the Nominating Committee shall be ineligible for nomination as officers or members of the Board of Directors of the Association, except to serve on the Board as a past president. In the event a majority of sheriffs in any region indicates to the Nominating Committee in writing before April 1 their choice of an Active member to serve as Regional Director, then the Nominating Committee shall nominate that individual as a Regional Director at the annual meeting. (i) The Nominating Committee shall select its Chairman, who shall notify the Directors and the Active members at least fifteen (15) days prior to the annual meeting, of the nominees for the ensuing year. The report shall include the names of the nominees and the names of the retiring officers. Section 2. Appointed by the President. All committees and their Chairpersons shall be appointed by the President, unless otherwise provided in these Bylaws. Section 3. Other Appointments. The President shall make other appointments as necessary, including but not limited to, a parliamentarian, two (2) sergeants‑at‑arms and a chaplain. Section 4. Committee Meetings. Committee members may participate in meetings by, or conduct the meeting through use or, any means of communication by which all committee members participating may simultaneously hear each other during the meeting. A committee member participating in a meeting by this means is deemed to be present in person at the meeting. Roberts’ Rules of Order shall govern the procedures to follow at all meetings of the membership and the Board of Directors of the Association. Section 1. How Amended. These Bylaws may be altered, amended, or added to by the Board of Directors at any meeting of the Board of Directors, provided, however, any amendment proposed to alter, amend, or add to the bylaws pursuant to this section must be submitted to the Executive Director, the Bylaws Committee and the active membership at least one hundred and twenty (120) days prior to the scheduled Board of Directors meeting. Section 1. Severability Clause. If any section or article or any part of these Bylaws shall be determined null and void, the remaining provisions shall be in full force and effect. Section 3. Audit. The Executive Director, or the President if there is no Executive Director, shall insure that there is an annual audit conducted by a certified public accountant of all funds received and expended by the Association. Upon completion of the audit, the audit report shall be presented to the Board of Directors and made available upon request to the active members. Section 4. Notices. A notice or other communication may be in the form of an electronic transmission.